"A Wolf in Sheep's Clothing": the UCIrvine Olive Tree Initiative. "Stop the Olive Tree Initiative movement goes viral". Tensions in Orange County Jewish Community Erupt. The Olive Tree Initiative: A Fig Leaf for Anti-Semitism? What’s the Matter with Boycotting Israel? New English Review: Orange County, California J-Fed Letter Exposes Hamas Contact during U.C. Irvine Olive Tree Initiative Trip in 2009. "A Chapter That Should Be Expelled from Hillel"
Are Jews Funding Israel’s Foes? On campus, community money flows to Islamist propagandists. The program sends students to Palestinian territories without much thought to safety or its own liability. Why Do Those Who Speak Out Against Anti-Semitism Suffer So Much Hostility From Many of The Jewish Organizations Who Should Be the Loudest Voices? 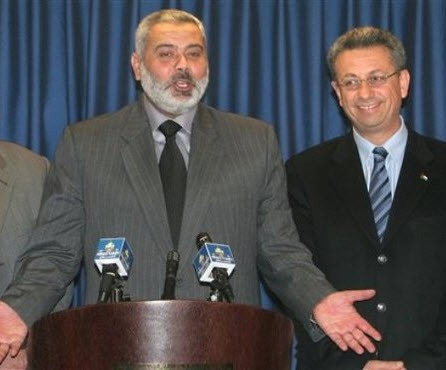 Mustafa Barghouti has met with UCI, UCLA, students ( Christian, Muslim Jewish). They refer to him as a man of peace " Ghandi " Here he is seen in a photo with Ismail Haniye ...... Barghouti is listed as an Institutional supporter of OTI in 2009. This is the same year that the students met with Aziz Duweik ( arrested by IDF 2006 and again in 2012. The OTI is spreading to all USA campuses and is planning on opening in high schools. The Olive Tree Initiative ( OTI ) sends (Jewish, Christian and MSU) students to meet with the very leaders and organizers of the Flotilla, Flytilla and now the Global March on Jerusalem using money donated to the Jewish Federation/Hillel. The OTI Jewish Students are whisked away to meet with the leaders of Hamas as soon as they set foot in the Jewish National Homeland. Hamas is involved in the organization and participation on the March onJerusalem.